From 23rd grid spot to 4th in five laps. That's the kind of amazing 17-year old Jamie Astudillo is pulling off right now. 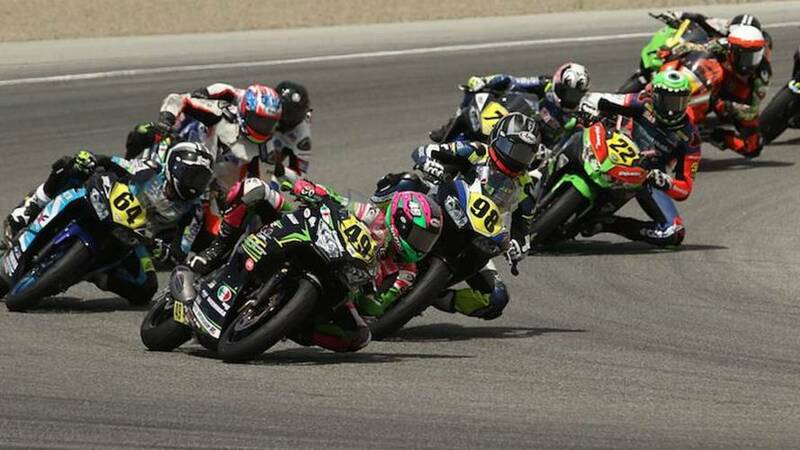 Out of all the MotoAmerica/WorldSuperbike races held on June 24th at WeatherTech Raceway Laguna Seca, I was most looking forward to the Liqui Moly Junior Cup. I was specifically looking for how Jamie Astudillo would perform and place. 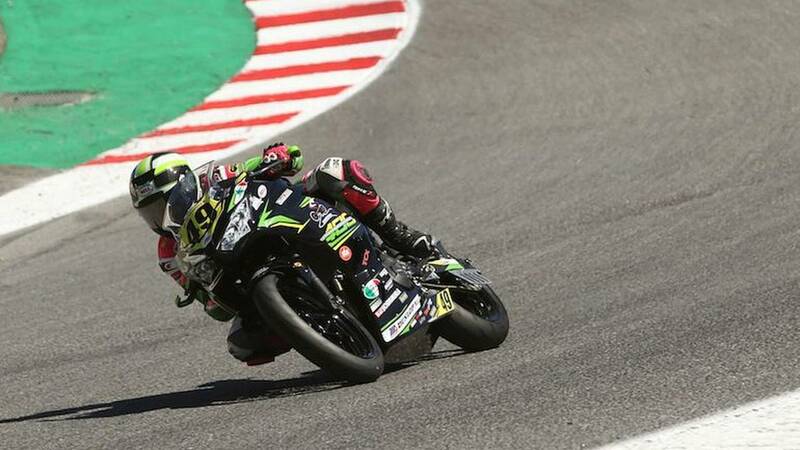 Afterall, the 17-year-old from Pennsylvania made history a few months ago at the Road Atlanta round by becoming the first female to take a MotoAmerica podium spot (she came in third place). Being one of the only top female riders in this national sport is really exciting, so naturally, I was rooting for her to do well in the race. Once the Junior Cup racers took off, I made sure to listen to the announcer and look at the big score board, which shows the top 10 riders. Astudillo, number 49, immediately placed herself within the top 10, which is no surprise since she qualified fifth overall that weekend. Good thing she's easy to spot out on track. As with the majority of promising young racers, they usually come from a motorcycle family. It's no different for Astudillo who’s father was a motorcyclist from Ecuador; her mom is from Costa Rica, and she was born in New Jersey. Astudillo has two brothers who are seven years older than she is who also ride. The boys began racing at a young age (around eight years old), so when she was just three-years-old, her parents decided to get her into two wheels as well. She actually began racing at three, even though the minimum age was four. 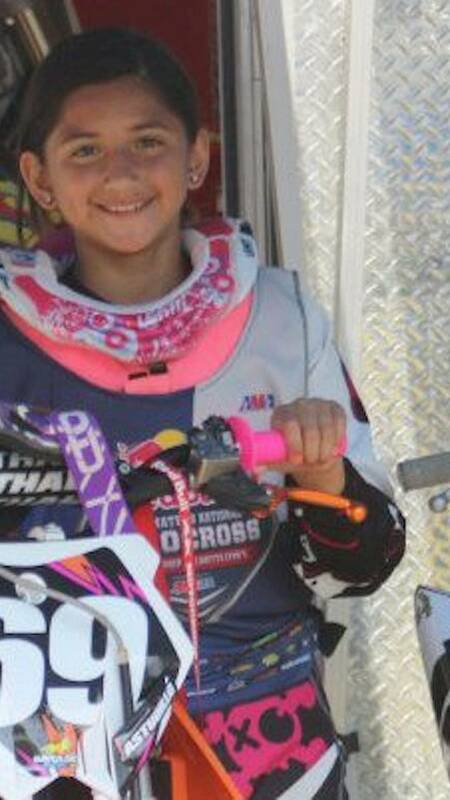 “It was motocross riding since the very beginning, and I started competing at three. I wasn’t even allowed to race! The age for motocross or any type of motorsports is four years old. So my mom was actually the one that signed me up and she kind of lied--she’s like, ‘Oh she’s four years old, let her race!’” she said while laughing. She got started early. At an age most girls haven't even learned a bicycle, let alone a motorcycle. Astudillo naturally fell in love with riding and racing—so much so, that she’s about to graduate from high school early since she's homeschooled most of the time. Since middle school, she would go to a brick and mortar school for half of the year, and the other half she would be homeschooled. Before December 2016, Astudillo never even considered or thought about road racing. It was veteran road racer Melissa Paris who planted the seed and reached out to her via a Facebook message to see if she’d be interested in joining her brand-new race team. Paris explained that her goal was to get more women in the sport, but not only that, Paris wanted more female racers as front-runners. Astudillo was up for the challenge. At first, Astudillo had a hard time adjusting from dirt to road. “The speed is so different—it’s way faster than motocross. Especially last year, I was so not used to it that it took me so long to mentally get used to it—I was scared. The bikes out there, they aren’t too fast. Obviously, for the normal person they like, ‘whoa, those are crazy fast.’ For a racer, they’re not that fast,” she explained. Not only did Astudillo need to adjust to a new speed and style of riding, but she also had to adjust to her competition. When it comes to racing with the guys, things get a bit intense. “When we're on track, do treat me a little differently—they treat me harder than the other guys. When they come up on a guy, they’re like playing it smart, they’re like thinking about it. But when they see me, they try harder, and they’re just willing to knock me out of their way if they really have to. They are more aggressive with me than they are with the guys,” she said. Astudillo’s first season as a rookie road racer didn’t go as smoothly as she had hoped. In 2017, MotoAmerica still had the KTM RC Cup series, and she finished the year 18th overall in the point standings. She also parted ways with Paris’ team and signed on with the Quarterley Racing/On Track Development team for 2018. Not only that, 2018 is the first year of the Liqui Moly Junior Cup series, which allows young racers to race multiple brands of 300-400cc bikes instead of the sole KTM 390. 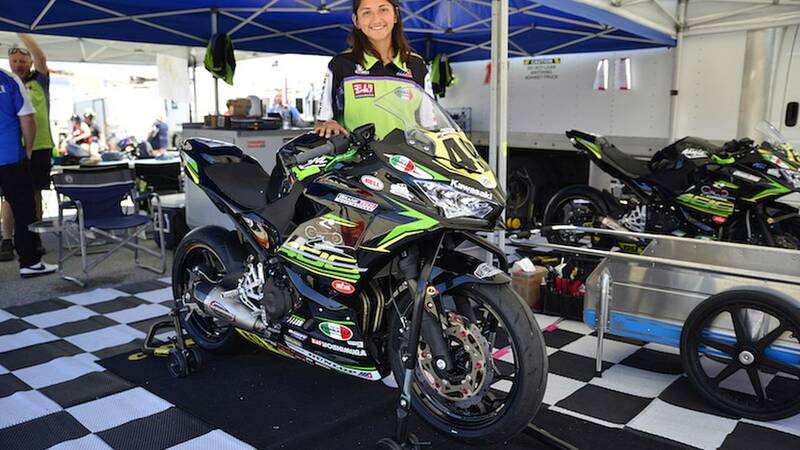 With her new team, Astudillo got set up to race a Kawasaki Ninja 400 for the season. But unfortunately, seat time was limited heading into her first race at Road Atlanta in April. She was able to ride the bike twice before the event, so she initially wasn’t comfortable with it. However, once the weekend's qualifying event went on, she and the 400 eventually clicked. After the Road Atlanta race, the Ninja 400s were stripped from 12K max RPMs to 10K to ensure and reassure an even playing field. “I feel like we’re pretty even now with the R3s—they can draft us, we can draft them. I think everyone is happier now with how it is,” Astudillo said. Her Ninja 400 race bike. And Astudillo brought the definition to life at the Laguna Seca race. After I heard that Astudillo crashed, a few laps later, the race was red flagged. I asked Greg if he knew if she could restart the race if her bike was rideable and passed tech. He wasn’t sure, so we just had to wait to see if she’d grid back up. Not only did she have a killer start, but she was slowly picking off fellow racers, one by one. You could tell that she clearly had one mission: Get to the top spot. By lap four she was in fourth place, getting so close to another podium spot. However, as previously mentioned, the restart had only five laps, so it wasn’t quite enough to get her there. "I just kept chipping away, and I was angry," she said with a laugh. "I saw that I was closing up to everybody and even the front guys, and if only we had one more lap…"